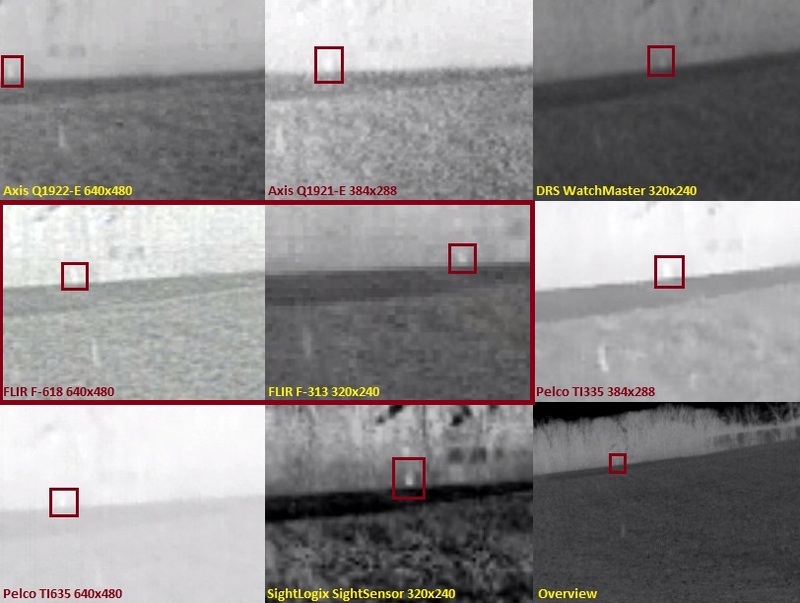 In this report, we share our test findings of FLIR's F series IP thermal cameras, one of the most widely used and highly configurable lines they offer. We compare the F series against models from Axis, DRS, Pelco, and SightLogix at various ranges. We also provide an overview of the camera's configuration and physical construction. Far more configuration and optimization options than competitive cameras compared. Greater complexity and risk when using due advanced options. Solid contrast compared to others in our tests. Limited web interface, requiring proprietary tool to configure imaging settings. Detection capability at far distances modestly better than average competitor. Details at close range using default settings are moderately worse than average competitor. Price: The F series ranges in price from about $4,500 USD MSRP for a wide angle 320x240 resolution camera to nearly $25,000 for a long-range VGA model. Aside from FLIR's F series, we will also be testing their new FC series, with a smaller form factor, PoE support, and new web interface in an upcoming report. Compared to competitive models, FLIR offers more options for equalization, palette, and image quality. Most competitors offer only contrast and brightness controls, basic equalization, and black hot/white hot palettes, where FLIR offers fully customizable equalization zones, gain control, numerous palettes, and other settings which may be directly adjusted. FLIR intends for default settings to be appropriate for the vast majority of conditions, regardless of location or season. However, because of these extra options, FLIR cameras may perform better in adverse conditions where others fall short, if an experienced integrator adjusts these settings for the scene. This configurability does come with a potential drawback, however. Untrained users may easily become lost in these settings, potentially negatively impacting image quality. 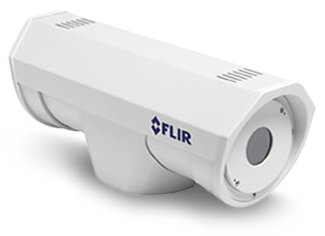 It is therefore recommended that users who are unfamiliar with FLIR's advanced configuration simply use default settings, or contact the factory for assistance. The camera's larger size larger lenses to be accomodated, up to 100mm focal length, without requiring a different housing. This is especially key to the F series, as the imaging module may be replaced with a different focal length and resolution. Users looking for a more compact unit with PoE support (but lacking the interchangeable imaging modules) may use the FC series instead. We will be reviewing this model in an upcoming test. In this screencast, we provide an overview of FLIR's configuration process. Unlike most IP cameras, where configuration is performed simply through the web interface, FLIR uses a basic web interface and more complex configuration tool, adding a step in installation. The web interface can be cryptic, and is used mostly for network and CODEC settings. All image quality settings are changed using FLIR Sensor Manager, FLIR's configuration and monitoring tool. Note the large number of options found in the camera's FSM options screen, for EQ, gain, palette, and other settings. FLIR has developed a new version of firmware with a redesigned web interface which merges many functions previously found only in FSM. This firmware will be reviewed in our upcoming test of the FC series. 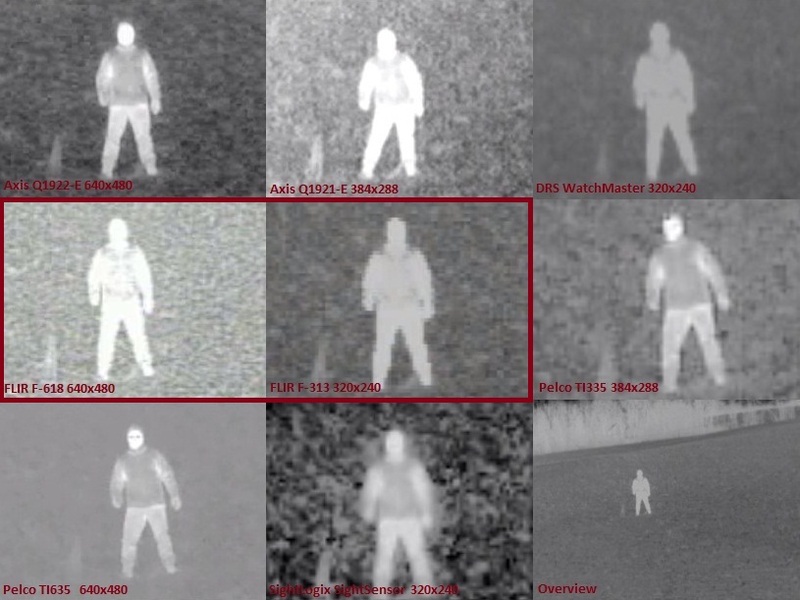 In our thermal camera shootout, neither the 640x480 nor 320x240 models produced extremely detailed images as some competitive cameras did at close distance (~150'). This is evident when comparing them to theAxis Q1922, Pelco TI335/TI635, and SightLogix images below, where the subject's pants, shirt, vest, and even glasses may be seen. However, both the F-618 and F-313 provide contrast reliably, with sharper edges than some competitors. At ~1,800' range, little detail is discernable using any camera, but the F-618 and F-313 provide modestly better contrast than most competitors, with the subject a little easier to spot against the treeline.